The DRTB-Rails Series DIN Rails enhances design capabilities, saves space and reduces labor. DIN rails have been accepted throughout the world, allowing the designer to mount a wide variety on control components, devices and terminal blocks, etc. on the same rail. 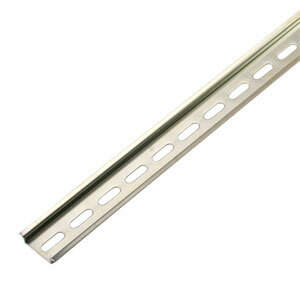 DRTB-Rails are perforated steel with electrolytic zinc plating and available in 35x7.5mm and 35x15 mm sizes. These DIN rails comply with DIN 50045, 50022 and 50035 standards. Pre-cut DIN rails are offered in widths to match enclosure sizes. An enclosure, 12H x 10” W, would use DRTB-RAIL-10. This DIN rail measures 8.75" wide, just short of the 8.88" wide sub-panel. Support brackets elevate DIN rails away from the sub-panel to facilitate component wiring access. Angled brackets tilt the DIN rails by 45° to improve visibility. Straight brackets are available in three heights for optimum positioning of the rails. Pre-cut DIN rail for 24" wide enclosure, actual width 20.75"
Non-Metallic Fiberglass Electrical Enclosures with Solid or Clear Polycarbonate Covers, NEMA 3R and NEMA 4X for Indoor or Outdoor Use - 6x6 to 20x16"